THRIVE Chicken TVP is your go-to option for a chicken replacement that stores well and is low in fat. By adding this soy-based alternative to classics like chicken pot pie, steamed rice, or enchiladas, you'll be increasing your daily intake of protein, fiber, and iron; that makes it a smart choice for your health and your tastebuds. 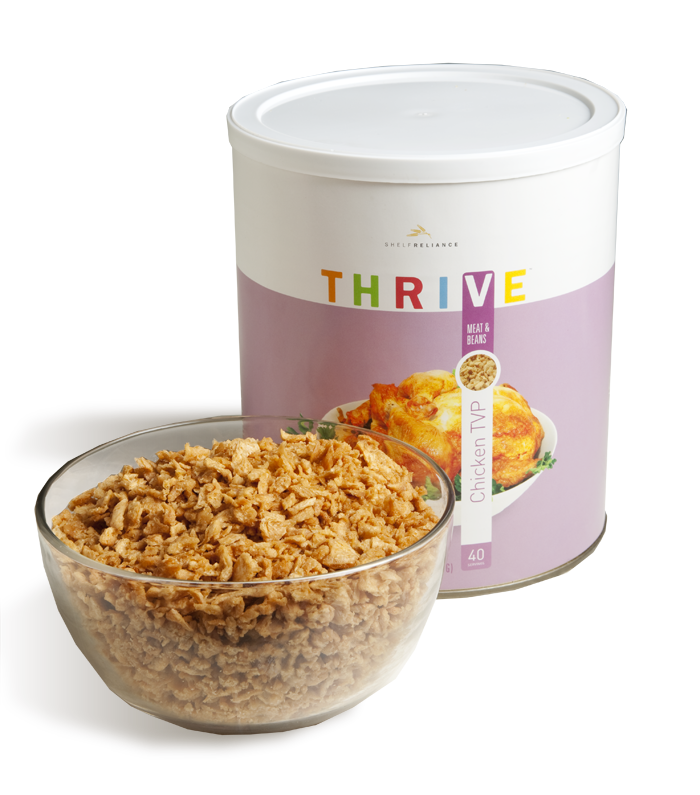 45 servings are contained in each can, and a shelf life of up to 10 years means that THRIVE Chicken TVP will be ready to go whenever you are. TVP (Textured Vegetable Protein) is an excellent protein source that is easy to store and use. TVP is made from soy flour that has had the soy oil extracted. It is cooked under pressure, then extruded and dried. TVP is high in fiber and low in fat, making it ideal for food storage and everyday use. Because TVP is not made from meat, it does not run the same contamination risk from bacteria such as E. Coli and Salmonella. TVP is soy based and perfect for those on a vegetarian diet. Soak 2 1/2 cups TVP in 2 cups hot water until tender. Use it in recipes just like you would regular meat, in tacos, burritos, sloppy joes, and more. Try adding some TVP to your fresh meat - it'll make the meat go further and keep your meal cost down.